Could Lagerfeld’s cat Choupette inherit his millions? The pampered eight-year-old puss has enjoyed a jetset lifestyle eating off silver platters since Lagerfeld “kidnapped” her in 2011 from his young friend, male model Baptiste Giabiconi. Now she could be about to inherit a slice of his estimated $200-million fortune. 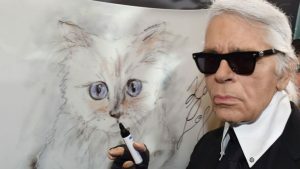 Long before his death on Tuesday, Lagerfeld said he had made sure that Choupette would go on living in the style that she had become accustomed to, with her own personal bodyguard and two maids. “She has her own fortune,” he added, thought to be at least three million euros ($3.4 million) which she earned with him doing adverts for a German car firm and a Japanese cosmetics brand. Choupette who the designer they called the Kaiser compared to the enigmatic star Greta Garbo is something of a cult figure in the fashion world, with more than 170 000 followers on social media. She is also the hero of a book, “Choupette: The Private Life of a High-Flying Fashion Cat”, where she was photographed in arms of supermodel Linda Evangalista and snuggling with model turned actress Laetitia Casta. Unlike them, the spoiled feline has never had has to watch what she eats. “She is like a human being, only with an extra quality silence,” Lagerfeld quipped. Lagerfeld, an incorrigible collector of art and fine furniture also famously showered his friends with gifts and money. Choupette’s big rival for the Lagerfeld millions is likely to be his godson Hudson Kroenig, who the designer utterly adored, seeing something of himself in the blond 10-year-old son of his muse, US model Brad Kroenig. “I consider them like my family,” Lagerfeld said of the Kroenigs, using Hudson and his brother Jameson in many of his spectacular Chanel shows at the Grand Palais in Paris.. He often appeared at the end to acknowledge the applause holding Hudson’s hand. Yet Lagerfeld thought so highly of Choupette that if she had died before him, he wanted to have her ashes scattered with his own and his mother’s. Under French law, Lagerfeld could not leave his millions to a cat. The post Could Lagerfeld’s cat Choupette inherit his millions? appeared first on SABC News – Breaking news, special reports, world, business, sport coverage of all South African current events. Africa's news leader..